Sometimes it helps to step back and take stock just in case you have started to lose perspective completely (hypothetically speaking, of course). So, I've decided to make a list of the good, the bad, and the ugly from our first week in our new home. If I had my office together and computer up and running, I'd make a clever table-like chart. But since I'm blogging via phone, you're out of luck. No more Comcast. And added bonus? Since we no longer have Comcast, I no longer need to remember our child-lock PIN, which I changed and then promptly forgot. This means I can watch movies and TV rated higher than PG for the first time since February. Score! Massive gluten-free and organic sections at the grocery. On the downside, no one told me they don't take credit cards, so I had to make an embarrassing and unexpected run to the bank while the cashier held onto my food. My bank is only 8 miles away instead of 25. Ren and I now have a bedroom on an entirely different level of the house. That means I can't hear it when the kids wake up and start fighting over Lego at 5 a.m. Added bonus? Separate rooms for them means they fight less over Lego anyway. Gluten-free buns AND trains at a nearby restaurant. The colors we chose for the kids' rooms might just work after all. A word of caution: "Lone Star Quilt" by Dutch Boy paints is a heck of a lot darker than you'd expect. Fortunately, once you add a bit of furniture and an off-setting color scheme, it's really not that bad. We have more than one bathrooom. WE HAVE MORE THAN ONE BATHROOM! No raucous college kids or crime watch signs anywhere in sight. You can really buy just about anything online. You can buy just about anything online. We know no one here except the realtor and the guys remodeling the basement. 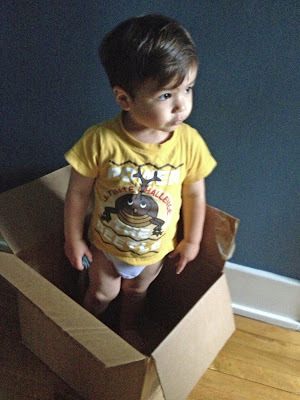 The basement remodel means most of kids' toys are still in boxes. I knew we shouldn't have believed it when they said they'd be done by move-in day. It's absolutely no fun to get to a zoo you've never been to before and realize your spouse can't really walk and the two kids most able to help push the wheelchair are only interested in high-risk driving. Even though we have more than one bathroom including an "en suite" far from where the kids sleep or play, someone still always manages to interrupt me every time I try to relieve myself. Every. Single. Time. Explaining the kids' allergies and dietary restrictions always makes me look a) pathetic, b) overbearing, or c) like the most unlucky parent in the world. People usually respond by feeling sorry for me, being slightly annoyed, or acting visibly shocked. I'd forgotten how terribly unhelpful these responses really are. In guess, really, things aren't that bad. I think Ren's back is clouding my judgment. That's the only truly ugly. Okay, so I totally did not mean to leave you hanging. Ren is fine, aside from the random facial swelling that comes and goes and always responds to Benadryl. Is anyone else married to someone who has allergic reactions to major changes? I'd feel better if you said you were. Since my last post, we packed, I lectured for two days at a seminar miles from home, we packed some more, and, then, we moved. So, here we are, and I've managed to let several perfectly good blog posts pass me by in the process. 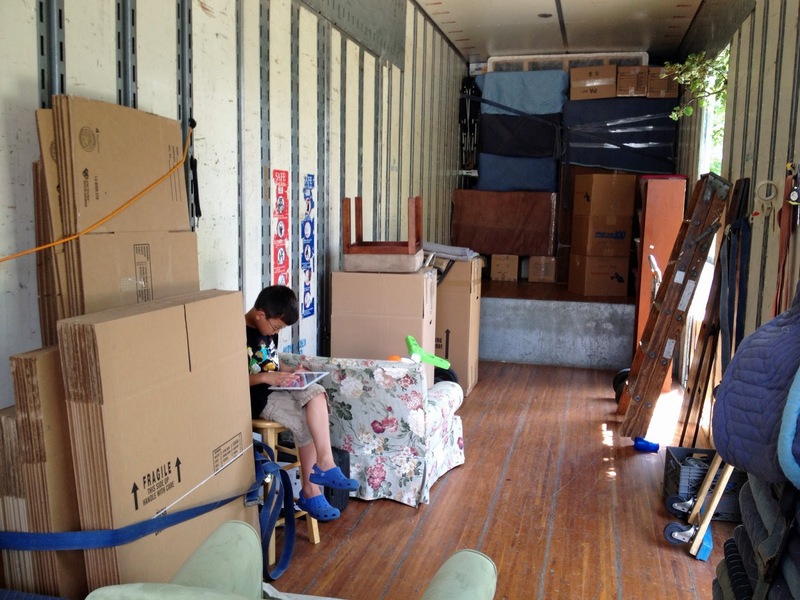 I think I'll try to pick up where I left off: what I hate about moving. The biggest thing I hate about moving is change. As a kid, I wept at the end of each school year. I mean, how could anything ever be as awesome as Mr. Mills' fifth-grade homeroom? (For the record, I was right about fifth grade. My sixth-grade class was full of delinquents who did things like remove bricks from the bathroom wall during restroom break. Do you know how excruciatingly boring it is to sit through an entire afternoon of rebukes and explanations as to why such behavior is inappropriate?) Turns out Ren also stinks at change, so you can imagine what sort of children we've spawned. Sky's last speech appointment, which was also his last visit to the children's therapy center that has been a second home to us post diagnosis, did not go well. I'm sugar coating here. A more appropriate description would be that it was one of the most hellish 45-minutes I've ever spent. Ever. The therapist wanted to spend ten minutes creating social stories for the move before shifting into free play (in celebration of Sky's last day there). He would have nothing of it. Instead of 10 minutes of work followed by 35 minutes of play, we had 45 full minutes of meltdown, which included but was not limited to the following: screaming, crying, fleeing, kicking, knocking over chairs, and yelling at the therapist. It was awesome. And by awesome, I mean, utterly heartbreaking. For everyone. Forty-five minutes is forty-five minutes. And the therapist had other appointments, so the session ended with me sitting on the floor holding Sky in a bear hug to help calm him. Of course, before we left, both the therapist and I reminded Sky that sometimes his choices (in this case, adamant refusal to do what he's told) lead to unpleasant consequences (in this case, the worst ending to anything ever). After all of the positive experiences we've had there, it was a crappy way to end. It made me cry. But that's the thing about moving: there never seems to be enough time to lament your losses. Ninety minutes later, I was on the road to my lecturing gig. By the end of my two-hour drive, I had a sinus infection. Because, of course I did. This ensured that all of us were sick just in time for the move that took place the day after I got back from my trip. If you're wondering why I scheduled the move right after a three-day business trip, you obviously don't know me at all. Of course, part of the problem was that the movers started loading the truck a day earlier than planned. 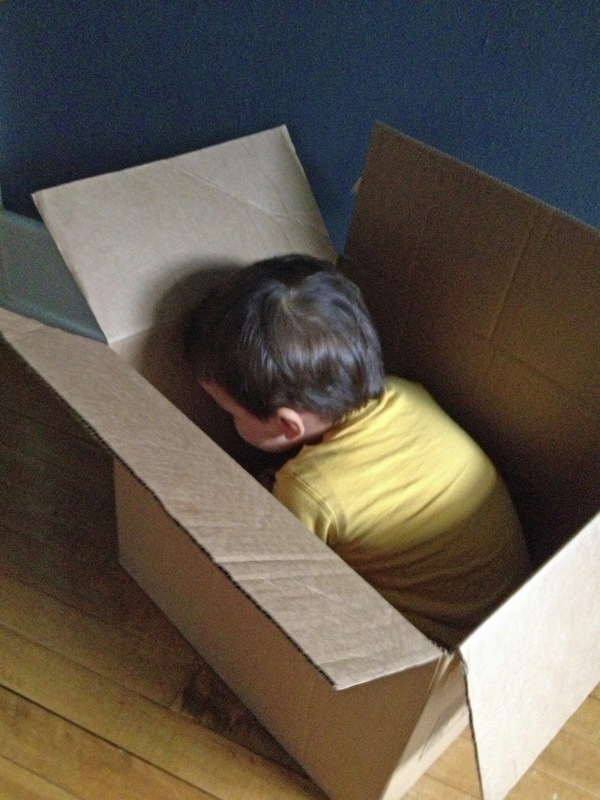 Between the removal of a couch and two love seats (which we sold) and the sudden invasion of strange men who insisted on putting all of our things into boxes, the kids lost it very early in the moving process. Fortunately, numerous friends swept in to help. They took the kids to play, helped pack boxes, kept me supplied with Diet Coke, drove our trash away, and treated us to our favorite Thai carry-out for lunch. On the second day of the move, two friends even showed up at 6:30 in the morning to help with the final packing push before the movers arrived. Thanks to the help of many, we survived the move. Okay, since I have no idea how to properly end this post, I'll leave you with a picture. 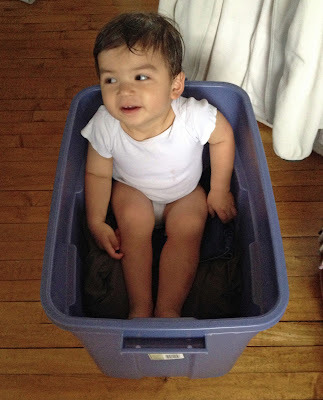 How do you keep a kid from freaking out during a move? Lots and lots of Scribblenauts. That, and giving him something to do. Here, he's guarding the truck while the movers are at lunch. Potential thieves don't realize they could steal every single thing from under his nose and he'd never realize it. Maybe it's fitting that I don't know how to end this. You know in the movies when they disintegrate something into a million tiny particles and shoot it across the room/town/world/galaxy before it's reconstituted somewhere else? And you know how sometimes in the process of putting all the pieces together, some of them get scrambled, wreaking all sorts of havoc? Well, moving is a lot like that for me. I guess I should just be happy I managed to write anything at all. I think from the title, you may know where this is headed. Our final moving preparations ran into a slight snag when Ren woke up Wednesday with a numb and slightly lopsided face. Now, if he hadn't been complaining the previous couple of days about feeling light-headed, and if he hadn't complained of a severe headache the night before, I probably would have just ignored it. We've been married long enough that I know he won't go to the doctor unless he thinks he's dying (or experiencing the symptoms of a detached retina, which actually kind of freaked him out). And he seemed coherent enough--at least as coherent as one can be in the midst of a major move with small children. But then my dad called and pointed out that the symptoms were pretty consistent with someone having a stroke. When he put it that way, I kind of saw his point. After all, Ren IS a male of a certain age and he DOES have a history of high blood pressure. So, I convinced him to go to Prompt Care. In an ideal world, the Prompt Care doctor would've said it was nothing. But, he couldn't reach that conclusion based on he evidence we presented him. So, he sent us to the ER for a brain scan. I hate the ER in our town. Don't get me wrong. The people are nice enough. But, after several visits, I'm convinced that the strategy is to keep you there long enough so that you actually forget why you are there because all your symptoms have no choice but to subside. Ren spent five hours in the ER waiting for an MRI and the results. It didn't help that a storm hit just as he finally got into the cylinder, causing a power outage that delayed the process an additional thirty minutes. It also didn't help that the first two hours of our time at the ER included our children since I couldn't find a sitter. In the end, the kids got to hang out with two of their favorite people and Ren got a day off from stressing about the move. The tests were all inconclusive, other than to show that he did not seem to be experiencing an emergency. The next morning, he woke up with swelling on the opposite side of his face, and that's when I realized just how much moving stress stinks. We've moved so many times that Ren actually had an allergic reaction to it. So, I gave him some Benadryl. And, after a day of Benadryl fog, he woke up this morning feeling just fine.